How to Go Glamping at Bear Lake, Utah. It's More Luxurious Than You Think. From all out luxury to renting a single room, there are endless options for travel lodging these days. However, for active travelers looking to get back to nature, glamping is a popular way to rough it, but without sacrificing comfort. 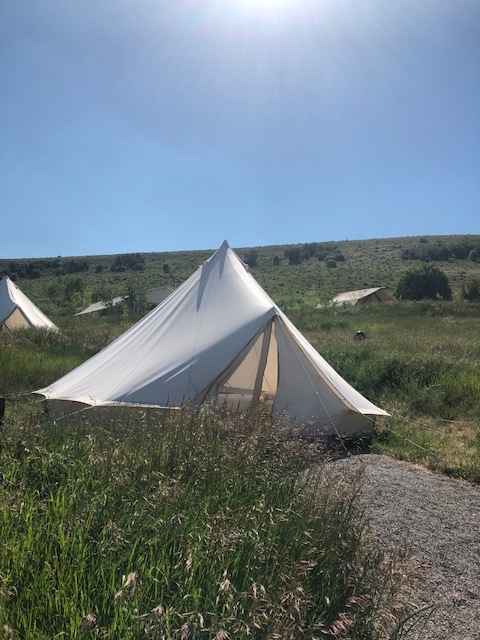 Today, guest contributor and glamper extraordinaire, Anna Reid, is taking us glamping at Bear Lake in northern Utah. From a plastic bubble in Iceland, to a former monastery in Italy, to Colorado’s off-the-grid yurts, I often plan trips around unique lodging. 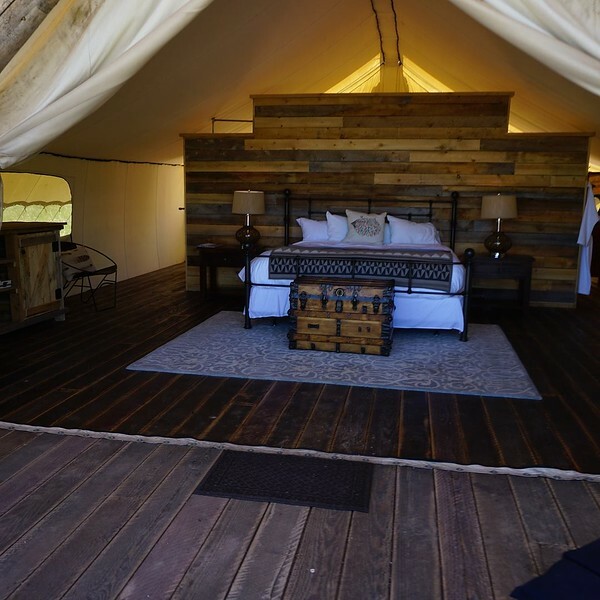 A general web search led me to a glamping destination in northern Utah that appeared both rustic and upscale. It was the perfect road trip stopover between Arches National Park and the Grand Tetons, providing a welcome break from my pop-up tent and camp stove. 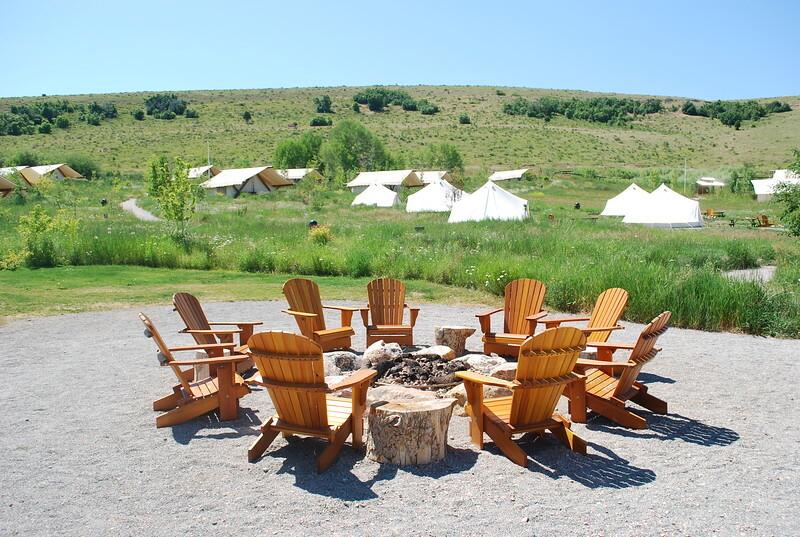 The camping site features an expansive landscape with central fire pit for socializing. Conestoga Ranch opened in 2015 and offers the best of both worlds for active baby boomers. Why compromise luxury for adventure when you can have both? The old wagons certainly took us back in time! 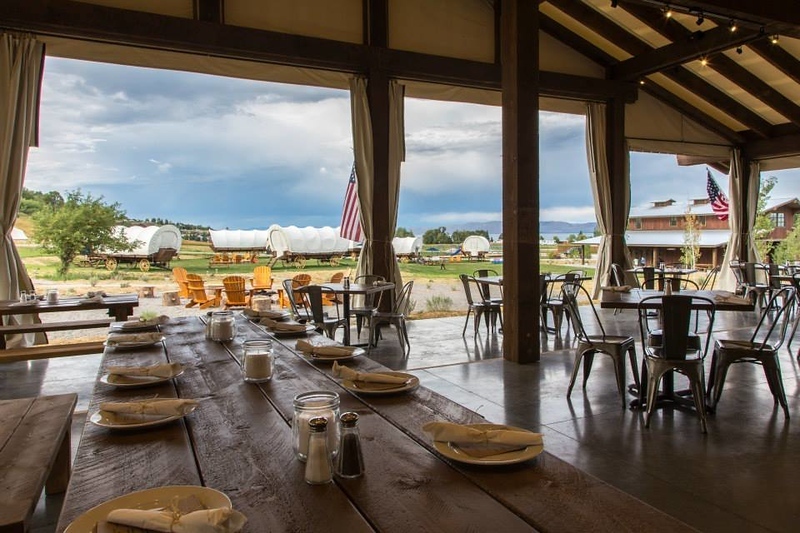 The focal point of the property is the circle of replica Conestoga wagons, commonly used in the 19th century as horse-drawn freight wagons and eventually used as transportation for pioneers to migrate west. 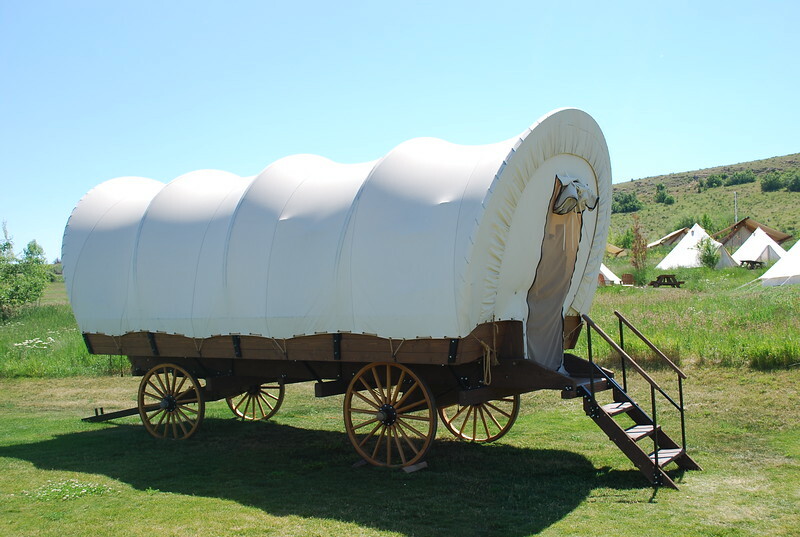 These wagons are available for overnight lodging, but I booked a small canvas tent overlooking the distant Bear Lake. The tents looks small, but come with all the basic amenities. When I arrived at the ranch, I was greeted with complimentary ingredients for s’mores before a host transported me and my luggage past the game room and general store to my accommodation. The thick, canvas tent was well-appointed with a queen-sized bed, fresh towels, linens and extra blankets. A few tents have ensuite bathrooms and for the others, private bathrooms and showers are just steps away. 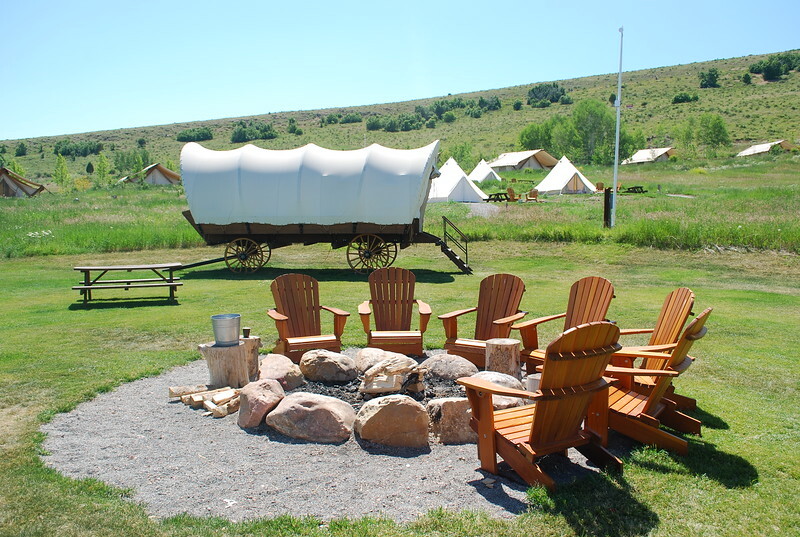 All the sites, including the covered wagons, contain lanterns, picnic tables, Adirondack chairs and a fire pit, which the staff will enthusiastically light as part of their “campfire valet service.” Firewood is complimentary and delivered upon request. Conestoga Ranch also offers daily housekeeping. The fire pit was a fun place to sit back and get to know everyone. The ranch seemed especially peaceful during the day, but boomers who want to experience active travel options can explore the area both by water and land. The Conestoga Ranch offers complimentary bikes, solo and tandem. A short ride on the mostly flat roadway lead to the marina, restaurants and coffee shops—even across the Idaho border. During the summer months, the local hub is the jewel-toned Bear Lake. Outfitters dot the highway offering motorized boat, jet ski, paddleboard and kayak rentals. Has this article inspired you to plan a Utah adventure? Check out our Utah Travel Planner to get started! In nearby Logan Canyon, a host of adventures await. Explore the mountains by horseback or ATV with instant access to rugged trails, then return to the ranch for an on-site spa service. Both Logan Canyon and Bear Lake offer walking trails for all abilities. Mild temperatures make for perfect hiking weather. To visit one of the last glacial lakes in the area, take the short and easy Bloomington Lake path. For a longer hike, try the nine-mile wildflower-infused Sink Hollow Trail. Another popular spot recommended by the ranch staff is a well-shaded moderate track to Wind Cave, a limestone arch formation. In the evening grab a seat at the on-site restaurant, the Campfire Grill, or gather around the community fire pit. Either way, you will find an expansive beer and wine selection served by the welcoming and friendly bar staff. If you prefer to forego happy hour, sunset yoga is offered on the lawn during the summer months. Dinner options include wood-fired pizzas and fresh salads, rendered duck breast and glazed salmon. For breakfast, pick from cinnamon swirl French toast or butter biscuits with smoked pork. Prefer to cook your own meals? Take advantage of the outdoor kitchen underneath rendezvous BBQ tent. Though the ranch is closed during the winter months, the area offers ice fishing, snow skiing, cross-country skiing and snowmobiling. Other accommodation that ranges from RV parks to rental houses is available year-round. Glamping at Bear Lake looks like a wonderful adventure! Have you ever gone glamping in a wonderful location? Come join the conversation at the My Itchy Travel Feet page on Facebook. Or send us an email with your thoughts. Anna Reid is a writer and traveler who has visited nearly 30 countries. The best souvenir she ever brought home was her Scottish husband. They met at a roadside smoothie stand in the Cook Islands and now base their adventures from Nashville. A previous contributor to My Itchy Travel Fee, her writing has also appeared in Dreamer’s Creative Writing, Intima: A Journal of Narrative Medicine, Claudius Speaks, Cold Creek Review and more. She is currently working on a travel memoir. Connect via Instagram @anna_reid_me or at Anna Reid.